Today, at 23, Ben does indeed have an extraordinary life full of friendship and purpose! 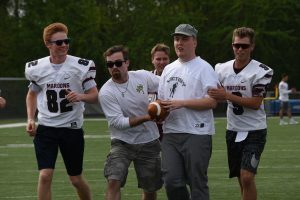 Though profoundly impacted by autism, his life has inspired Benjamin’s Hope, a 40-acre “live, work, play, worship” farmstead campus on the north side of Holland, a community in which people of all abilities are transformed by the love of Christ. Now open five years, Ben’s Hope celebrates abundant life happening in residential homes, the Life Enrichment Day Program, and through The Church of Ben’s Hope. Live: 30 men and women live at Ben’s Hope in six beautiful farm-style homes. Work: More than 90 people work at Ben’s Hope as SideKicks. 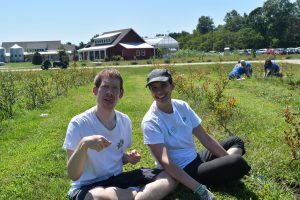 A SideKick provides care and support and is, by definition, “a friend, a companion in adventure.” 25 men and women participate in a weekday Life Enrichment program growing skills in gardening and animal care. Participants volunteer all over the community – at Kids Food Basket, The Holland Museum, Resthaven, to name a few. hayrides, antique trucks, and even a helicopter! Ben’s Hope men and women are out and about town at sporting events, concerts, the library. And on Thursday nights, Ben’s Hope offers Club Connect, a super cool club for people of all abilities run by Hope College students. Worship: The Church of Ben’s Hope meets every Sunday night at 6 p.m. This refreshing and wildly inclusive all-abilities worship is a great place to connect with the Ben’s Hope community. The statistics are staggering. Today one in every 59 children will receive a diagnosis of autism, according to the Centers for Disease Control. Historically, individuals with profound disability have relied on the public health care system to provide needed housing, supports and funding. However, the reality is this: The public dollar is stretched. The need is growing. And people chronically struggle to find the support they need to live an abundant life. Ben’s Hope relies on an engaged community and charitable support to continue its everyday extraordinary work. Each month Ben’s Hope must raise $20,000 to cover the shortfall of Medicaid. Community giving enables the non-profit to remain debt-free while providing for nutritious food, excellent staff, a safe and beautiful campus, engaging programming, and authentic worship. Communities everywhere are challenged to think in new and different ways about where people with autism will live, work, play and worship. Ben’s Hope is a community solution of public/private partnership that is leading the way and inspiring a bolder vision of abundant life for people with autism.  Krista Mason, executive director and founder of Benjamin’s Hope – and Ben’s mom. Previous Previous post: LIVING SUSTAINABLY: Have yourself a merry greener Christmas!